8:30 am, not the best time to set off if I wanted to get as far as possible on the first day, but I wanted to drop Nat off at work and say goodbye before hitting the road, and her office is on the way out of Barcelona. Wanting to save some money, I had decided to avoid the coast motorway and I headed east towards Lleida and then Huesca. The only difference between the coast route and this one up to this point is that this one is free. Other than that, almost 300 km of boredom. Once past Huesca and on the way to Jaca things get more interesting, though. I wanted to cross the Pyrenees through the Somport, one of my favourite passes. The road down the valley on the French side is amazing and the scenery breathtaking. 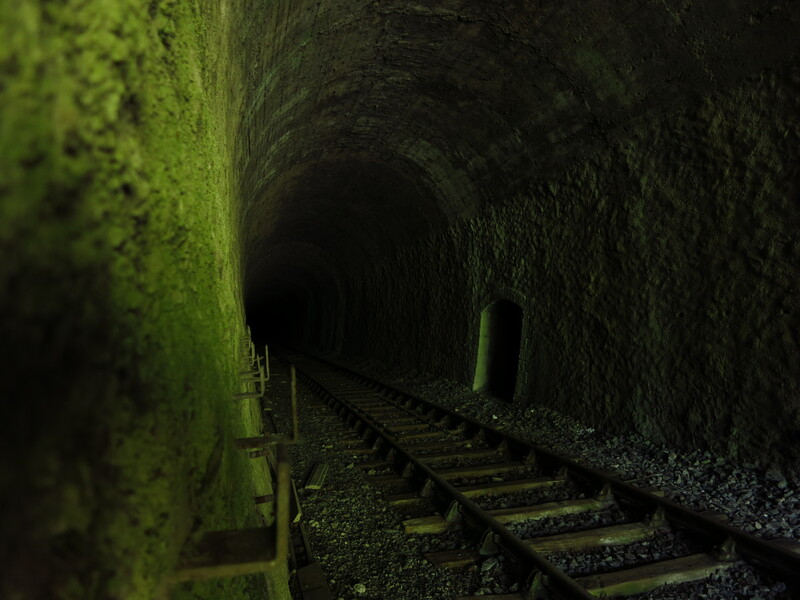 Not only that, there is also the abandoned station of Canfranc on the Spanish side, and the train tracks and stations of the French line that used to connect to it on the other side of the border, as well as the Fort du Portalet. I did not have time to visit all of this again, but it is always nice to take a look. The day was beautiful, but as I climbed up the southern side of the Pyrenees the temperature dropped, and by the time I reached the top of the pass it was quite chilly while on the move. It was already lunchtime and in my mind I had pictured having something to eat sitting at the top of the pass, gazing over the gigantic mountains all around me, but there was nowhere nice to sit other than a rather depressing car park, so I got on the bike and rode down to find a decent place to eat. And as luck would have it, after passing a couple of spots with picnic tables but too many cars parked by, I found an empty picnic area in the perfect spot for a weirdo who likes exploring old places like me. 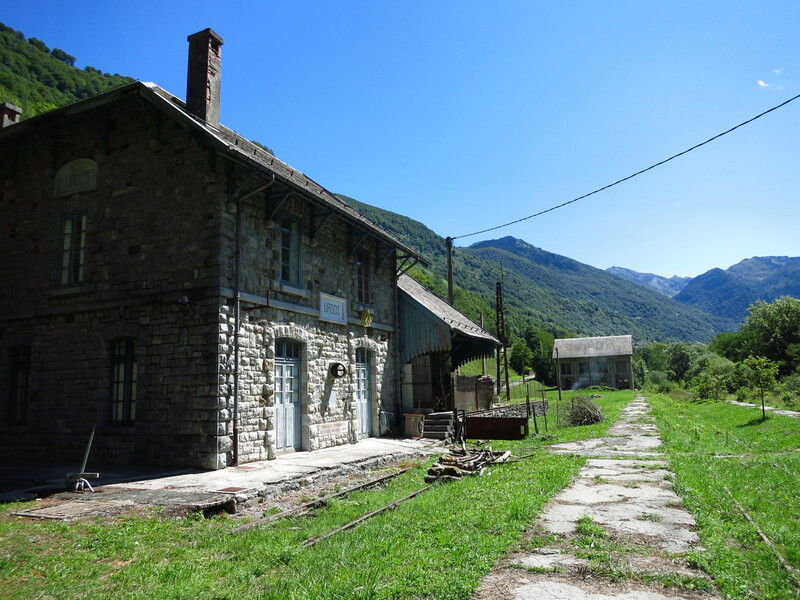 Just past the tiny hamlet of Urdos there is one of the old train stations that someone has refurbished. It did not look like a bar, hostel, tourist office or any other of the usual things that old stations end up being used for, but rather a private residence. Strange. In any case, past the station and next to the old tracks, there was a nice picnic area, with a couple of tables in the shade of some ancient trees and a view of one of the old train bridges. There was even a tunnel on the other side! Obviously, after having lunch, and seeing that the access across the bridge and into the tunnel was not closed, I decided to explore a bit. The switches on the rails coming into the station were still intact, and even though they were very rusty, if you were strong enough you could operate them – I almost injured my wrist. 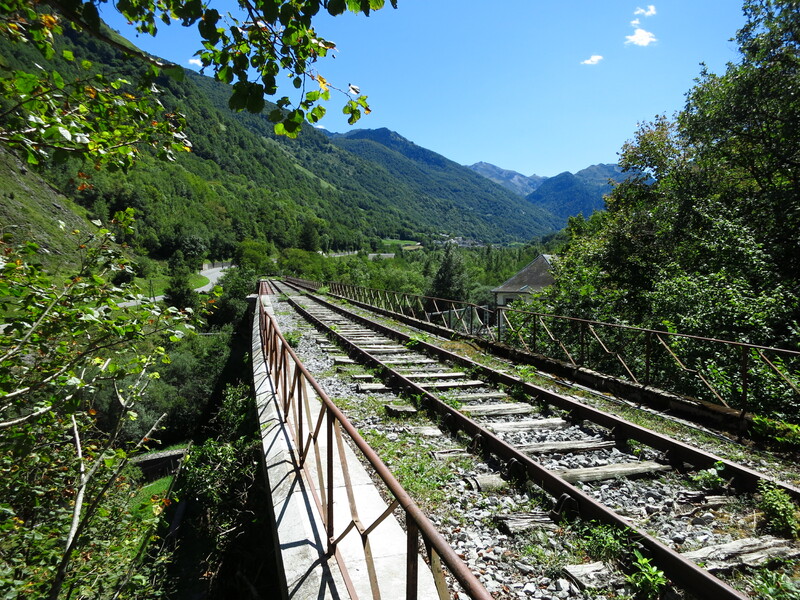 The bridge was also all rusty, but the rails were laid on solid steel beams, and as long as I walked on the beams, not on the sheets of metal covering the gaps under the rails, there was no problem to cross the bridge. Below it ran a stream of water coming down from the snow high in the mountains and up ahead of me, the dark mouth of the tunnel. 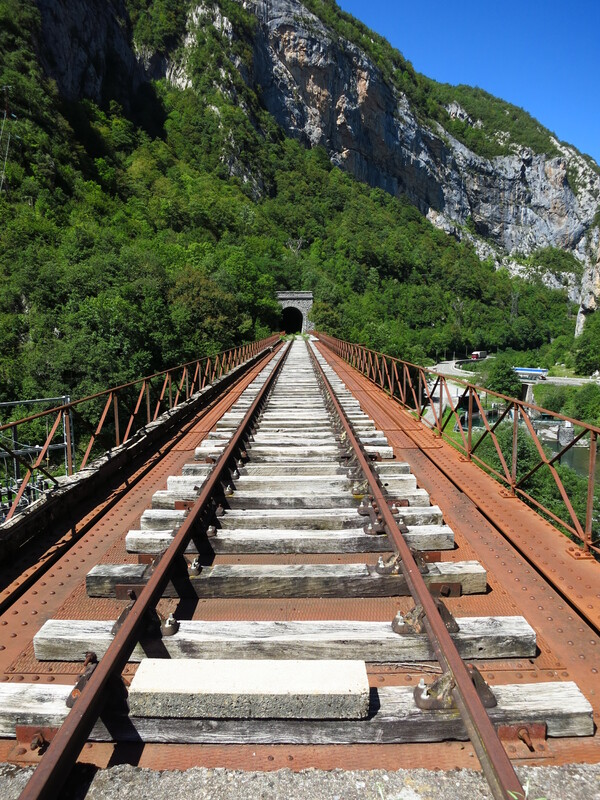 On top of it there was an engraved signed with the construction date – 1922, which reminds the adventurous visitor that the line only operated for 48 years. Despite having seen no maintenance since 1970, the tunnel was still in remarkable good condition, and I was able to walk quite far into it. It was not possible to see any light from the other end, so I don’t know whether a section of the vault had collapsed further down, or this was one of the long tunnels and it had a curve. In any case, it was already 2 pm and I had more than 500 km to, so a future expedition was decided and I got back on the bike. Two corners down the road I had to brake sharp when I saw a car that was practically stopped and in front of it, a Renault Clio with some flashing lights on its roof driving at walking pace. At first I thought it was a special transport or maybe some road works, but it turns out that it was a group of visitors walking towards the Fort du Portalet. It seems that the restoration work is over and it is now open to visitors. Because it can only be accessed from the road, and since the gorge is at its narrowest point here and there is no room for any kind of vehicle to stop, a bus drops people off at the old train station I had just left (there is a regular bus stop there) and then they walk a few hundred metres down the road. The Clio is there to hold the traffic and prevent a few tourists from getting killed. It is good to see that the old fort can be visited again – another reason to come back here some other day. And unfortunately, that was the most interesting part of the day. From there on I just tried to find – without much success – the fastest way to get to Pau and there I took the motorway. Not my favourite way of travelling, but a necessary evil if I wanted to at least get past Bordeaux in time to find somewhere to sleep. I had a list of Youth Hostels with me, and decided that the further I could reasonably make it that day was Saintes. I had no idea what the town looked like, and I was glad to see that instead of being some sleepy small city surrounded by industrial parks it was a nice little quintessentially French town. The hostel was near the centre but it a quiet area, they had secure parking for my bike, breakfast was included and because it was almost empty, I got a room to myself for the price of a dorm. Wonderful. Off to bed early, as the plan was to get an early start and try to get to the Cap de la Hague by early afternoon. This entry was posted in Normandy 2015, Travel and tagged Canfranc, Fort du Portalet, Pyrenees by Kilian. Bookmark the permalink.